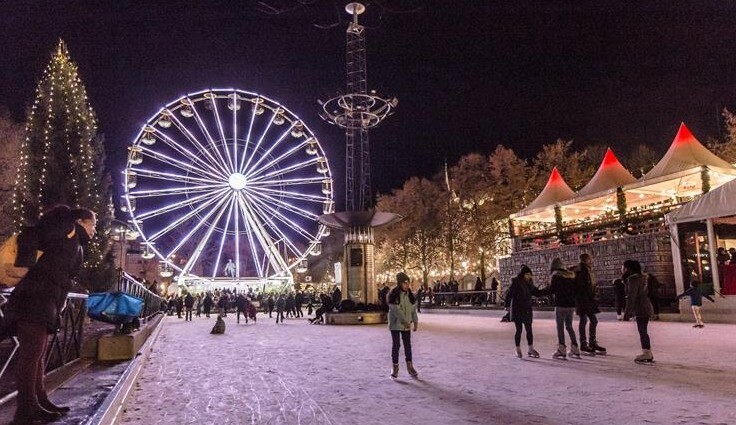 The city of Oslo has a very nice Christmas market, and if you are going to visit the city in the period between November 17th and December 23rd in 2018, make sure to check it out! There are several small markets and temporary markets worth visiting in Oslo, but the main Christmas market is arranged at “Spikersuppa.” This is a square located between the Parliament and the Royal Palace, along the Karl Johans Avenue. At this square, you can find lots of stands from where you can buy all sorts of souvenirs and snacks. This is a place where you can taste Norwegian traditional snacks for this period, for example, Smultringer (a sort of donuts), and other snacks. There will also be possibility to go ice skating at the square, and if they follow tradition, there will also be a big Ferris wheel at the square. It is free to enter the Christmas market area, but you will have to pay for whatever you decide to buy or activity you decide to try. The Christmas market in Oslo will be open from 10.00 in the morning until 20.00 in the evening, except for Fridays and Saturdays when it will be open until 21.00. This will be a fantastic treat for visitors to Oslo in this period. But, do not forget to bring warm clothes, because it can get really cold in this period! Would you like to know more about Christmas markets in other cities in Europe? Some of the most popular Christmas markets in Europe are the ones located in Prague and in Vienna. Read more about the Christmas markets in Prague right here and about the Christmas markets in Vienna right here. Merry Christmas and enjoy your stay in Oslo! « Visit Norway – not Kashmir!